The "catch pens" at a rodeo arena are used to hold (or "catch") the calves and steers after they have finished their run in the arena. As we mentioned above, the catch pens hold the calves and steers used in tie down roping, team roping, steer wrestling, and other events after they've completed their run in the arena. The catch pens are always located at the opposite end of the arena from the timed event chute. 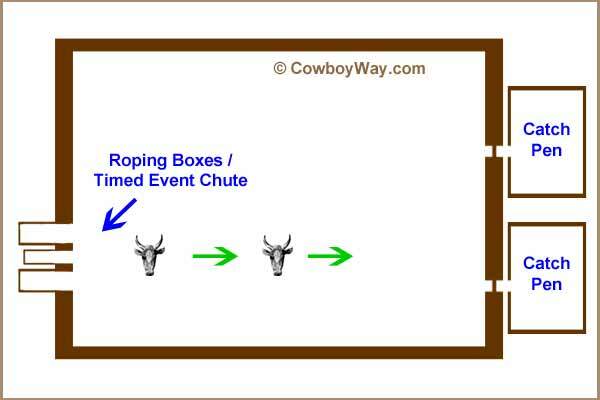 If you're not familiar with the timed event chute, it is the livestock chute located between the two roping boxes. The roping boxes are where tie down ropers, team ropers, steer wrestlers, and some other contestants begin their run. They're typically called "roping" boxes even though they are also used by contestants who are competing in non-roping events, such as steer wrestlers. 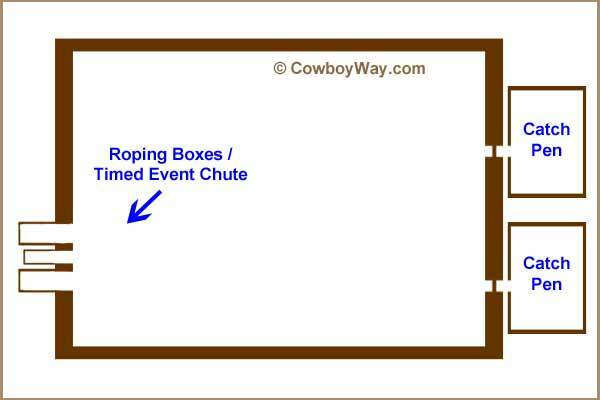 Between the two roping boxes is the timed event chute. It holds the calf or steer until it's released into the arena. The timed event chute is sometimes also called the "roping" chute even though it also holds livestock for events that don't involve roping, such as steer wresting. Like we mentioned above, the catch pens are located on the opposite end of the arena from the timed event chute. After leaving the timed event chute and running down the arena, the calves and steers always use the gates that lead into the catch pens to exit the arena. Rodeo stock contractors want their timed event stock to perform its best, and allowing the calves and steers to only exit into the catch pens is very important in helping them perform well. To understand why the location of the catch pens is so important, it's helpful to keep in mind that, in rodeo, it is a constant challenge to keep the conditions under which contestants compete as uniform as possible. For timed event contestants that follow calves or steers down the arena, one of those challenges includes encouraging the calves and steers to run straight so that each contestant can have a similar run. For example, if one contestant were to draw a calf or steer that zigzagged, or one that took a hard turn halfway down the arena, and still others drew livestock that ran straight, the contestants that drew the straight-running critters would have better odds (usually, at least) of having a fast run. So, in an attempt to help make the runs uniform, stock contractors and contestants both want the calves and steers to run straight down the arena. ......and that, of course, means increasing the odds of each contestant having the chance at a similar run. Below: An illustration showing that the calves and steers are encouraged to run in a straight line because they know where the catch pens are. While not everyone realizes it, rodeo stock contractors put a significant amount of time into training their livestock: Broncs, bulls, calves, and steers alike. One of the things calves and steers are trained to know is the location of the catch pens. If a calf or steer were to make a run then accidentally be allowed to exit through a gate other than the catch pen gates, they might learn to run for the different gate instead instead of the catch pens. A calf or steer like this is often difficult or impossible to retrain, and could be ruined for rodeo competition. Like the calves and steers, the broncs and bulls have a special gate they use to exit the arena. It's called the "return gate," and, similar to the catch pen gates for calves and steers, its location is important to help broncs and bulls perform their best. You can read about it here: The Rodeo Return Gate.